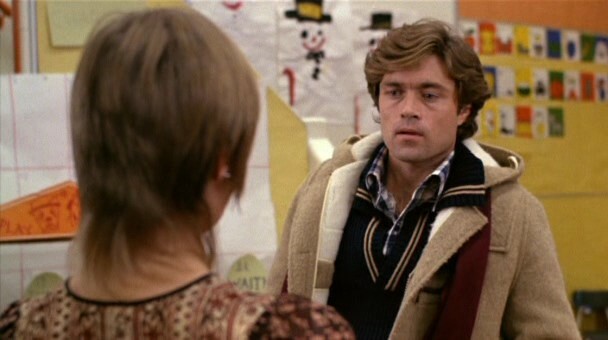 1979, Starring Oliver Reed, Samantha Eggar, Art Hindle. Directed by David Cronenberg. David Cronenberg established himself as Canada's premier auteur of the macabre with his first two films, Shivers (aka They Came From Within) and Rabid. Exploring the depths of the mind and its externalization through the body, Cronenberg was a burst of originality in the late 70s, when most horror filmmakers were reaping the benefits of past horror concepts. His films were a harsh critique of the burgeoning medical intervention of the time, showing how medical experimentation threw off the social balance of society. Both Shivers and Rabid documented the breakdown of society The Brood moves into a much more personal realm, the realm of the family. In the opening shot, the camera revolves around a therapy session facilitated by Dr. Hal Raglan (Oliver Reed). In his revolutionary new scientific method, Raglan assumes the form of the patients' worst fears (in this case the patient's father), and demands that the patient express his suppressed anger and resentment. Channeling his innermost thoughts, the patient lashes out at Raglan, yelling at him and asking him why he was not a better father. The patient's psychological anger also manifests itself in another way, through aberrations of the body. As the patient gets angrier and more in tap with his emotions, scabs and bumps begin to form all over his exterior. Not only does he externalize his feelings, but he also turns his psychological pains into physical ones. This radical new method of psychiatry, known as psychoplasmics, allows the patient to rid and address psychological traumas by bringing them into the physical world. Raglan has been gaining an intense following for his work, especially concerning his most notable patient, Nola Carveth (Samantha Eggar). Nola has been having troubles dealing with her faulty marriage to Frank (Canadian horror stalwart, Art Hindle) and the custody battle that is ensuing over their daughter, Candy. As a result, she has been placed under total isolated care with Dr. Raglan. Nola is the product of a broken home. Her parents divorced some time ago, and both are alcoholics. As a result, Nola has felt a sense of neglect in her upbringing, and she fears that the same thing may be happening with her Candy. In a radical psychoplasmic session, Nola expresses the hatred she holds for her mother. Although she verbally expresses her pain, her body remains seemingly free of the physical aberrations that are custom to the psychoplasmic process. Dealing with issues much more emotional than usual, her emotions become manifest entirely apart from her body they become "the brood". These little brooding children function through gas pockets on their backs, fueled by the rage of Nola's emotions. So when Nola confronts thoughts of her mother, the brood children exit her body and physically act out her emotions... they kill her mother. Candy witnesses the brutal murder, and attempts to suppress her knowledge of what happened. A sergeant in the investigation of Nola's mother's murder states that no matter how much one tries to stifle their hurtful emotions, they "tend to express themselves in one way or another." He did not know how literal he was being. As more people come victim to Nola's brood, and as Frank is out trying to piece together the details, Candy is left alone. A victim of neglect and psychological abuse, Candy is the sacrifice of marriage and psychiatry gone awry. Nola's brood kidnap Candy and bring her back to Haglan's psychiatric dwelling, in a subconscious attempt by Nola to regain custody of Candy. Frank, finally aware of the brood and Candy's whereabouts, heads over to Haglan's outpost to attempt to get her daughter back. What ensues is a bloody and expressive climax between two parents over the fate of their child. Nola reveals secrets held deep within, and the brood are finally destroyed. Although momentarily vanquished, the terror still remains... Candy develops lumps on her arm. In an ending most tragic of all, the feuds and mistakes of parents are transferred forth upon their child, continuing a chain that will only end in disaster. The Brood was a product of familial breakdown. At the time of its inception, David Cronenberg was in the middle of a divorce with his wife and a subsequent custody battle over their daughter. Although it is doubtful that Cronenberg's estranged wife was shooting off embryos of rage, the script is still very true to the trauma Cronenberg was going through. 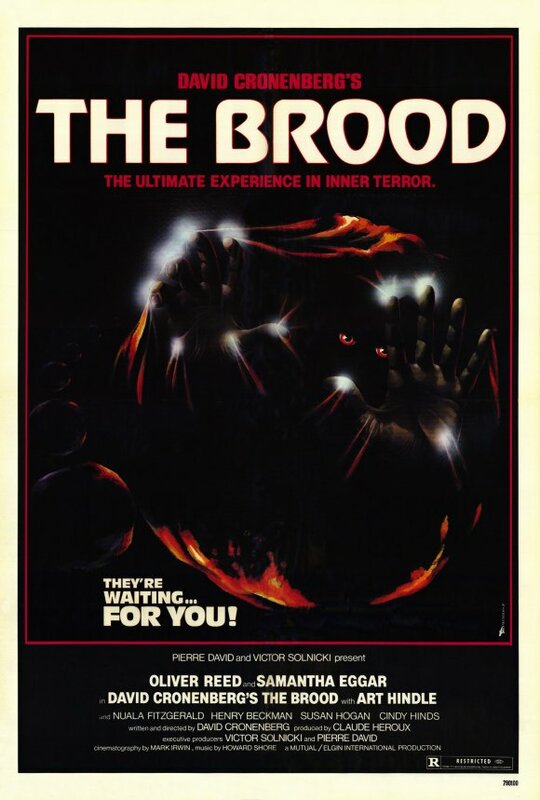 Undoubtedly his most personal film, The Brood is a much more deep and emotional film than his previous efforts. Where Shivers, with its extended cast of characters offered no real emotional core, and Rabid looked singularly at Marilyn Chambers' character, The Brood offers a heartbreaking look into an entire family. 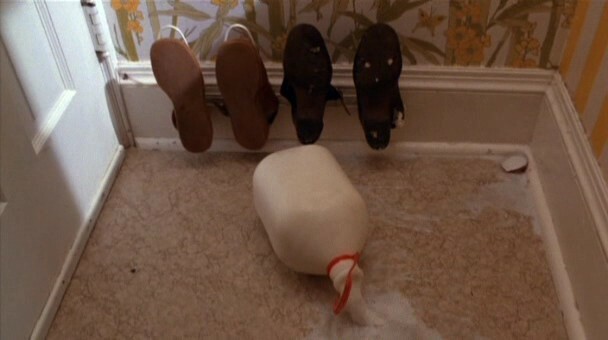 Although the brood kill many throughout the film, there is no victim greater than Candy. Silent almost entirely throughout, she is left only to observe the breakup of a marriage and the pitfalls of emotional jealousy and anger. There is nothing sweeter than Candy, but the familial decay removes all her serendipity. Shivers and Rabid both used their urban landscapes to showcase the dehumanization of society. The Brood is much more organic in its locales, using the dreary wintry forests as a symbol of isolation and decay. Canada's winter landscapes are in full display throughout, with several dark and cool shots of rural Ontario. Outside of a verbal mention of Halifax, there is little else to distinguish the film as explicitly Canadian. Like most of Cronenberg's films, the locations here are meant to be as universal as problems of divorce and custody. Cronenberg's social commentary is not limited to Canada, and his undistinguished city contains that common look of Small Town, North America. Although Cronenberg has been hailed as of late as one of Canada's premiere motion picture artists, right along with Atom Egoyan, nothing equals the power and creativity of his underground horror efforts. Before he ever hit Cannes, Cronenberg was making Canadians throw up. Devoid of any sort of artistic pretense, his films were raw, bitter and profound, and The Brood, with its personal story and emotional power, remains to this day Cronenberg's crowning achievement. In the realm of Canuxploitation, it doesn't get much better than The Brood.